Charlesbridge Publishing has come up with two awesome new titles to be released this fall that center around MATH! As a child (and a teenager, college student, etc.) that struggled with math, I want to do everything I can to give my kids a leg up when it comes to understanding all things mathematics. Math can be a tricky subject for kids, so finding great resources like a children’s book that can help even the most mathematically-challenged of parents is a huge blessing. 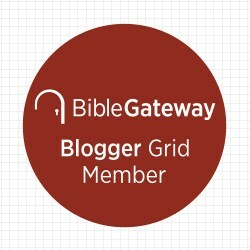 I think you will find both books to be useful, helpful, and appealing to kids! The first book is, “Eat Your Math Homework: Recipes for Hungry Minds.” (Awesome title huh?! I couldn’t resist selecting this book to review!) This book is written by author Ann McCallum, and illustrated by Leeza Hernandez. You can purchase a copy of the book HERE. 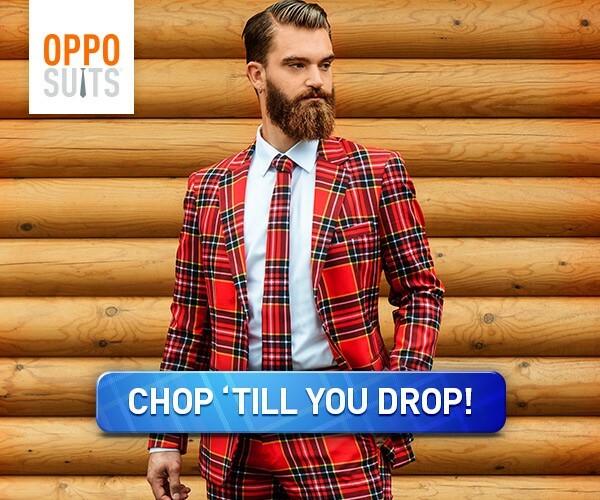 It is also available on amazon.com. 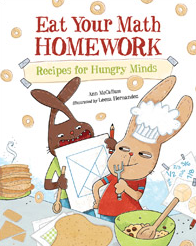 In this book, you and your child can whip up 6 tasty math treats. There are things for the seasoned math student such as “Fibonacci Snack Sticks”, to something even young mathematicians can appreciate like “Fraction Chips.” Our favorites were “Tessellating Two-Color Brownies” and “Variable Pizza Pi.” Not only were the recipes delicious, but the author includes awesome features like, “Math Appeteasers” that promote critical thinking and problem solving centering around the math skill or concept being introduced. Ann McCallum so creatively packs a ton of information into this book in such a non-threatening way, and really explains things in such a graspable way (even for us parents that aren’t super math-saavy!) With illustrations, follow-up activity ideas, background information, and a handy dandy glossary, this math cookbook is definitely the recipe for the hungry math mind! 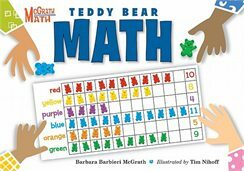 The second incredible book from Charlesbridge is Teddy Bear Math authored by Barbara Barbieri McGrath (of McGrath Math) and illustrated by Tim Nihoff. I have always been a huge fan of counting bears. When I was in the classroom as a kindergarten teacher (and sometimes in my second grade classroom as well), we frequently used counting bears to illustrate mathematic principles. Just two pages in, and your child has already been exposed to the ideas of estimation and graphing. (How cool is that?!) Your child will be guided through how to use their counting bears to make an estimate, graph actual results, and then interpret the graph to check their estimate. (Seriously, the teacher inside of me is uber excited about this! Do you even know how many math standards this book is touching on?!) Your child is shown how to add using the bears (*as a sidenote, I highly recommend using manipulatives to teach your children basic mathematical functions!) And Barbara McGrath does just that…In this adorable picture book geared towards young children, she walks your child through addition, subtraction, multiplication, and division…and does it in a way that even a five year old can understand!! (AMAZING!!) 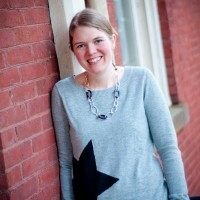 If all of this weren’t enough…she even touches on ordinal numbers! This is basically a kindergarten-first grade math curriculum in a few adorable pages…It’s genius really…To take such a wonderful manipulative and present them in such an accessible, friendly, and fun way is such a helpmate for teachers and parents who feel lost when it comes to math instruction….This is a tremendous jumping off place, and should give you ideas for math activities you can do with your child. I seriously love this book, and love what it has done for my daughter. You can buy the book HERE, or on amazon.com (The page I linked to on amazon also takes you to a place where you can purchase counting bears!) You and your child will love this book!